Fifa president Sepp Blatter has hit out at referee Valentin Ivanov's handling of Portugal's match against Holland. Both teams finished with nine men on Sunday after a game that equalled the World Cup record of 16 yellow cards and set a new mark of four reds. Blatter told Portugal's SIC television channel: "I consider the referee was not at the same level as the participants, the players. "I think there could have been a yellow card for the referee." Ivanov's amazing card spree increased the number of reds for the tournament to a record 23 - midway through the second round of the tournament. The 45-year-old sent off Costinha and Deco of Portugal and Dutchmen Khalid Boulahrouz and Giovanni van Bronckhorst, all for collecting for two cautions. 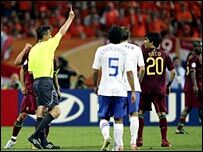 He also issued yellow cards to Portugal's Maniche, Petit, Luis Figo, Ricardo and Nuno Valente and Holland's Mark van Bommel, Wesley Sneijder and Rafael van der Vaart. And once Portugal scored what turned out to be the 23rd minute-winner from Maniche, Ivanov struggled to deal with mounting indiscipline from both sides as the game degenerated into a farce. A Fifa panel is set to meet on Wednesday to decide on the officials who will be staying on in Germany for the latter stages of the tournament. But following Blatter's stinging indictment, Ivanov's hopes of further responsibilities at the World Cup look bleak. Blatter added: "This was a game of emotion, with exceptional drama in the last instant, with a deserved winner. "But it was a great show with intervention by the referee that was not consistent and had a lack of fair play by some players." Ivanov has received some support for his performance from his father and former international striker Valentin, who played for the Soviet Union at the 1958 and 1962 World Cups. "I have heard that Blatter had criticised my son," Ivanov senior said. "But it was a very difficult game to officiate and I think he handled himself quite well considering the circumstances. "It was a very intense match, both teams were considered title contenders, thus no one wanted to lose and go home. "But it was Fifa itself who demanded from referees to get tough on players using foul tactics. Valentin just tried to follow Fifa's own instructions to stamp out rough play."